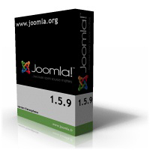 The version 1.5.9 [Vatani] of Joomla! is released. This is a security release, which correct a lot of bugs and some security issues. You are so encouraged to upgrade your current version as soon as possible.